A Nuclear Matters event that took place Thursday at the University of South Carolina presented the importance of the nuclear power plants operating in the state and benefits that they provide. Speakers at the event included former Secretary of Energy Spencer Abraham; chief nuclear officer of South Carolina Electric & Gas Jeff Archie; senior engineer with Duke Energy and regional lead of the North American Generation in Nuclear (NAYGN) Christine Johnsen; former Chairman of the South Carolina Public Service Commission David Wright; and director of the nuclear engineering graduate program at the University of South Carolina Travis Knight. 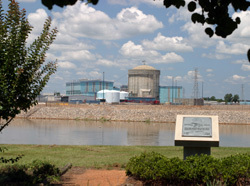 Abraham and Wright also serve on the Nuclear Matters Leadership Council. “Nuclear has a long history of successful operations in South Carolina, and it’s exciting to see the next generation of nuclear under construction in the state, reinforcing the value this greenhouse gas emissions-free nuclear fleet brings to our country,” Wright said. They stated that seven plants in South Carolina produce approximately 97 percent of the state’s carbon-free electricity generation. Nuclear Matters plans similar events that will take place across the country with a focus on the benefits nuclear plants offer. Want to get notified whenever we write about Nuclear Matters ? Next time we write about Nuclear Matters, we'll email you a link to the story. You may edit your settings or unsubscribe at any time.